While official sources offered contradicting reports over the fate of the Essam Sharaf government, and Sharaf himself as prime minister, they all point to a difference of views existing on how to handle several pressing crises, especially that between Egypt and Israel in the wake of an Israeli operation last month that entailed the killing of six Egyptian border guards (the sixth died of his injuries today Saturday), triggering angry demonstrations against the Israeli embassy. "Sharaf wants to be relieved of his duties, and this has been the case for a while. Since he took office in the wake of the revolution he has demanded an end to his assignment at least twice, but the (ruling) Supreme Council of the Armed Forces (SCAF) has declined," said one source. According to another source, Sharaf had the intention to again express the wish to be relieved of his duties during a meeting earlier today. One source at a leading state agency said that the resignation was presented and turned down, while another categorically denied that Sharaf presented his resignation. A source at the office of the prime minister earlier told Ahram Online that Sharaf was in favour of recalling the Egyptian ambassador in Tel Aviv, "even if very briefly", to meet popular demands of an angry Egyptian public in the wake of the border killings, but he was overruled by SCAF. The military council decided it was in the best interest of Egypt to settle for a mild expression of Israeli "regret" and a commitment to investigate the incident, along with securing Israeli consent for enhancing Egypt's troop presence in Sinai. Today, sources at the office of the prime minister could not be reached. Meanwhile, a source at the Egyptian Foreign Ministry said that a statement would be released shortly following a joint meeting of SCAF and concerned cabinet ministers on relations with Israel, following the showdown of yesterday evening when angry demonstrators took down the Israeli flag from the embassy in Giza for the second time in less than a month and managed to break into premises associated with the embassy, throwing downs hundreds of documents from the window of the 15-storey building in which the embassy is housed. The Israeli ambassador, who had just returned to Egypt, left Cairo with almost all of his embassy staff. It is not clear when or if he will return. An informed Egyptian source said that Israel, while not trying to increase tensions in relations with Egypt, especially in the context of its current showdown with Turkey, has conveyed its strong dismay to Cairo at the incident and is demanding clear assurances on the protection of its embassy and staff. 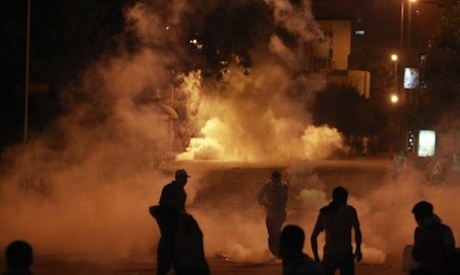 Meanwhile, a source at the Foreign Ministry said that no official protest had yet been forwarded from Tel Aviv to Cairo. The Egyptian Interior Ministry announced that it has been instructed to scale up the readiness of its police forces, especially around the area of the Israeli embassy. On another front, the current developments, according to diplomatic sources, could cause a delay in the visit of the Turkish prime minister to Egypt, that was anticipated for Monday. It is clear that the rampaging mob have no interest in returning Egypt to stability and prosperity. Contrarywise they are perversely intent on maintaining a state of anarchy. It is the ordinary Egyptian people who are suffering. They seek jobs and security. Currently they are getting neither. We sincerely hope that the premeditated chaos has now peaked and that sanity will henceforth prevail. Was it the egyptian guards who attacked the israelis? No, it wasn't. It was the israelis who killed them without reason. They obviously forgot that they have a peacetreaty with Egypt. Egyptians surely don't get it. They have no idea how to make their own country better. Why do they feel that they need to tear down an established country? Was the whole point of getting rid of Mubarak to finally attack Israel? Egyptians and arabs are taught to hate Israel because they are embarassed about losing. Arabs are extremely arrogant and have way too much pride. This "thinking I'm the best" is causing their behaviour and it will only get worse. If they have had peace with Israel since 1979, what is the point of starting this up again? The Egyptians just finished tearing down their own government and country, killing and wounding an untold number of people and now they're angry that several guards were killed by Israelis defending their border? When is this madness going to end, when there is no one left? No need to worry about crowds of tourists in Egypt. The way the people are acting and the lack of security...I can't imagine very many people being stupid enough to spend their money or risk their lives visiting Egypt. The rabble have cost their fellow country men a chance to earn a living.